Personally, I find LoTW’s security simple and logical: they are simply trying to make it hard for one individual to generate a lot of untraceable certificates (to sign enough falsified logs to get on the “Honor Roll”). And, since they optimized the database last (?) year, the processing and web interface are pretty good, too. I kinda just followed the directions and it worked. This is the photo I wanted to headline this post, but I refuse to hotlink or copy it. Positive, regularly-scheduled programming will return to the blog shortly, including a couple of construction projects…$50 HF triplexer, anyone? I have opined in the past (although perhaps not on the blog directly) that CW is the reason I am still an active ham after almost 19 years…actually, I think a week from today marks the 19-year anniversary of passing elements 2 and 3A in the basement of the Stark County Sheriff’s office. CW permitted me to make interesting, intriguing, compelling QSOs that I simply could not complete on SSB with my meager station as a beginner. Over the years, I have used this as the argument for retaining the Morse code testing requirement: Morse code proficiency gave newcomers the opportunity to make exciting DX contacts under all solar conditions (except disturbed, of course) and hook them on the hobby. PSK31 was the first mode that challenged CW in that arena. 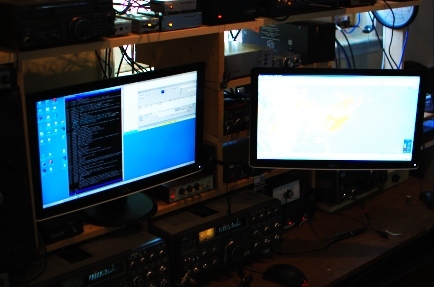 I made a couple of PSK contacts almost 10 years ago now and decided it was harder than CW. So, I did not pursue it. Aside from making a half-hearted effort to get ARRL’s Triple Play Worked All States using only unassisted (no cluster, no RBN, no skeds) contest contacts, I haven’t really operated digital modes much and didn’t really understand why anyone would want to because CW is so much easier. I’ve seen dozens of JT65 posts by fellow AmateurRadio.com bloggers. And, about a year ago, I met Paul, N8HM, who lives in an apartment in DC. He’s very active on HF digital modes with a shoestring setup…and he’s very passionate about it. That’s when it clicked. Digital modes are the new CW: the DX mode for the average ham. I must be slow! I still think CW is way easier than digital QSOs, especially in contests and pileups: there is a certain amount of critical humanity (varying timing, sending speed, spacing, or calling frequency) that you can’t apply to cracking a digital pileup…or maybe I just haven’t figured it out yet. I guess I have years of Morse practice and shouldn’t expect digital to be easy just because the computer is doing the sending and decoding. But, I think I understand digital operators a little better after this revelation. First of all, Happy New Year, loyal readers. I have been exhorted by several enthusiasts of the blog to write more. The months of November and December are busy around the Miller household with the CQ WWs, ARRL Sweepstakes, Thanksgiving, Christmas, and an annual professional conference on the West Coast between Thanksgiving and Christmas. So, this is a drought time of year for writing. A number of projects around the station have been started or completed and those will be written up as time allows. Travel and potential DX operation is on the horizon, etc, etc. 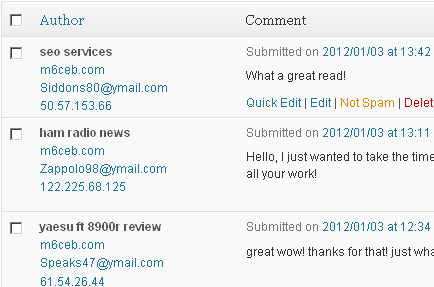 However, today’s topic is WordPress comment spam. I hadn’t checked the moderation queue on the blog comments for about six weeks until recently. There were some 1500 comments pending. Exactly two of them were from real commenters. (Thanks, by the way!) I could subscribe to a service (like Akismet) to stem the flow of spam, but I’m a cheapskate and skimming the spam is a bit like reading the police blotter in your local newspaper—a guilty pleasure. The Internet democratizes the sale of nearly everything, legal or not, by providing a low-cost storefront for a business that can be based anywhere in the world, plus (semi-)anonymous payment. This is great for obtaining otherwise unobtanium surplus electronics and parts. But, it’s also great for anyone selling anything else that is high-risk (for vendor or purchaser) or low-volume in a standard retail setting. The difficulty for everyone is getting your business noticed. Enter search-engine optimization (SEO): techniques that game search engine algorithms to increase your visibility in a search. Google’s PageRank, for example considers the number of links to a site as a measure of its popularity. So, blasting every blog’s comment boxes with links to your site is a brute-force way to game that system (except the smart engineers at Google have weighted PageRank with the “quality” of the linking page and a whole host of other trade-secrets). Some SEO schemes appear also to develop trees of “link farms” to improve “quality.” But, this is just an arm-chair assessment. All point to the same site and contain keywords about amateur radio topics (except the SEO one at top). So, I can infer that one of several things happened: 1. The site owner’s site got hacked and the SEO scumbags wove their material into it to make the SEO look somehow more “legitimate.” 2. The site owner acted (paid…*shudder*) on one of those spam e-mails every domain owner receives that offer to “increase traffic to your site.” 3. The site owner is an SEO scumbag himself. I’m leaning toward explanation #2, since the site itself makes him sound like the Homer Simpson line, “Oh, they have the Internet on computers now? !” Whatever the case, this is inappropriate behavior and I refuse to mention the site owner by name, callsign, or link, lest the action be successful. It’s the equivalent of splattering up and down the band on SSB when running high power to a good antenna. You’re a lid. Ever since I replaced my primary station computer (a decision that may be reversed soon—details in a later post), I desired to replace the remaining 19-inch Dell Trinitron CRT monitor with something lighter and smaller. Mom and Dad were in town a few weeks ago on a much-needed vacation and we went to the National Air and Space Museum’s Udvar-Hazy facility near Dulles Airport. This is only a few miles from one of the best used computer shops in the DC area—CedarPC. CedarPC is nice because they’ll sell you “damaged” stuff at a discount if you don’t care about the damage. I inquired about a 24-inch flat panel I had seen on the web site, but they could not find it. They did find me a nice 20-inch flat panel that was just missing the stand and the price was right. The missing stand was no big deal because I wanted to mount the monitor on an arm so I could bring it closer to the HF end of the station desk, tuck it in at the VHF end, or even swivel it out over the couch to watch a DVD. Sold. 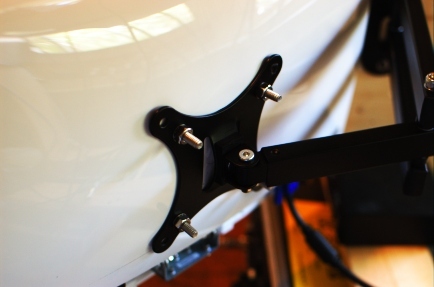 Monitor arms are generally expensive…at least 2-3 times what I paid for the monitor itself, often more. So, I went to trusty eBay and found something designed for mounting televisions for $15 including shipping. This did require some modification of the monitor housing and liberal application of wide washers to reinforce the plastic in the housing. But, it was done with all junkbox screws and washers. The May issue of QST arrived in the mail today and an article about building a “fox” for hidden-transmitter hunting was included. That brought back memories of a teenage project of mine that I had once thought of writing up for QST, but now just makes a good story for the blog. The first (and only) handheld radio I’ve owned is an Alinco DJ-580T. Like most HTs of a certain age, it has provision for an external (“speaker”) microphone. The microphone input is a sub-miniature (3/32-inch, “2.5 mm”) stereo phone plug. As a high school student, one of my passions was tinkering with a graphing calculator—the venerable Texas Instruments TI-85—do kids these days even use this stuff or have they gone the way of slide rules and nomograms? The TI-85 offered the provision to link to a computer or another calculator through a similar sub-miniature stereo phone plug. Well, one afternoon in probably 1997, I was sitting with the DJ-580T in one hand and the TI-85 in the other…and it hit me…I wonder if I can use the the TI-85 to drive the DJ-580T microphone input? A few preliminaries are now in order. Thanks to a helpful (and still operational, albeit now with a CMS and the attendant spam) web site called ticalc.org, a few friends and I had learned to load our TI-85s with third-party binary machine code programs with considerably faster execution times than the built-in scripting language. This allowed us to play relatively powerful video games surreptitiously on a school-sanctioned platform…a tactic that worked well until the English teacher wisened up to the fact that the five students with their calculators out were not typing essays on them. Not satisfied to just play games—although I did set a very high score in Tetris during Spanish class—I sought to harness the power of the Z80 microprocessor in the TI-85 for myself. Recall that this was before widely-available and inexpensive microcontroller development systems like the PIC, Arduino, and AVR. I gathered the tools and eventually managed to write some fairly sophisticated (given my utter lack of formal training in computing) software in Z80 assembly language, including a crude clone of Space Invaders and a crude adventure game I called “Kashmir.” Maybe some screenshots or stories about them will come later. But, for the story at hand, I learned how to manipulate the link port. Fortunately, the sleeve was ground on both the TI-85 and the DJ-580T. So, it was just a matter of tip and ring—one was audio and the other was PTT on the radio, and both were settable on the TI-85 for some kind of two-wire communication link. So, I reasoned that I could write up a bit of assembly code that would key the PTT by pulling it low, then toggle the audio line back and forth at 500 Hz or so to generate a rough audio tone. It worked! This was an expensive, although trivially so since I had the hardware, way to build a hidden transmitter. So, I modified the software to send my callsign in Morse code (using a look-up table) and stuffed the whole thing in a cigar box. It was good fun for a few of us teenage boys. And, for the interested, I found the original source code, which is sadly not well commented or dated. But, it does have my old callsign (AA8UP) listed by the lookup table. I have assembled some of my tools for massaging logs for upload to the ARRL’s Logbook of the World (LoTW). They’re written in perl and should run with just about any modern perl distribution, including that found on Macs and GNU/Linux distributions. The principal features are: conversion from TRLog log.dat and mangled Cabrillo files to ADIF and fixing hour offsets. Glad to see that someone else aggrees with me, at least from a security standpoint. This reminds me of a liberal arts professor I got to know as an undergraduate. I was a bit more idealistic at the time and told him that if he upgraded his Power Mac to OS X, he would be less vulnerable to viruses since it was based on (BSD) UNIX. “That makes sense, ” he said, “eunichs don’t get viruses.” Good guy, but weird sometimes.